The Chart below shows the Annual Inflation Rates for each decade. Each bar represents the average Annual Inflation for that decade (not the total cumulative inflation for that 10 year period but how much it increased each year on average during that decade). 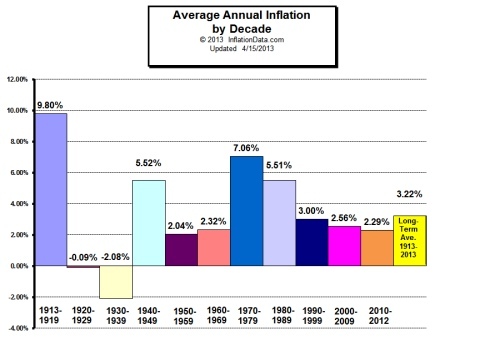 The final Yellow bar shows the average annual inflation rate since the government began tracking it in 1913. 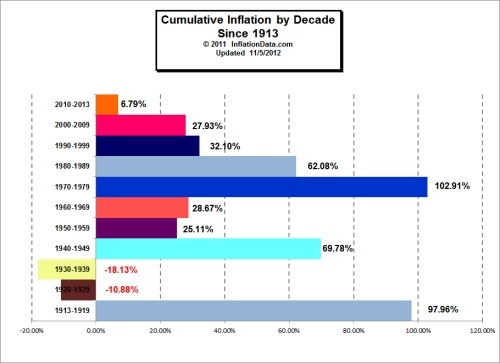 If we look at the cumulative inflation for the entire decade we can see that only two decades had prices that fell for the entire decade and that was the 1920's and the 1930's. The 30's you would expect because of the great depression but prices actually fell during the "roaring twenties"? Yes, even though the 20's were wild and crazy and immortalized by F. Scott Fitzgerald's classic novel, The Great Gatsby not everyone participated in the boom. The vast majority of Americans lived on farms and from 1920 to 1921, the price of wheat, the major crop of mid-west farmers, lost almost half its value. Cotton, the lifeblood of Southern farmers, lost three-quarters of its value. Thus the farms themselves lost 50% of their value since you would have to be crazy to want to buy a farm under those conditions. In addition, the supply of farms for sale increased because farmers were being foreclosed on because they couldn't pay off the loans they made on those "newfangled" tractors. Although it is possible that those same tractors were the cause of the increase in the production of wheat and thus the fall in the price. A possibly bigger factor was the government, which offered farmers a $2 per bushel price subsidy in an effort to supply Europe with wheat during WWI but when the war ended the subsidy drastically encouraged over production. As we saw the Average annual inflation rate is 3.22%. That doesn't sound too bad until we realize that at that rate prices will double every 20 years. That means that every two bars on average prices have doubled or about 5 doublings since they began keeping records. Since, 5 x 2 = 10, Five doublings sounds like maybe prices increased by 10 times, right? Or they are ten times as big as they were in 1913. But it gets much worse than that! Because it isn't just a arithmetic doubling it is a compounding. So just as compound interest can multiply your savings, compound inflation can multiply the effects of inflation. 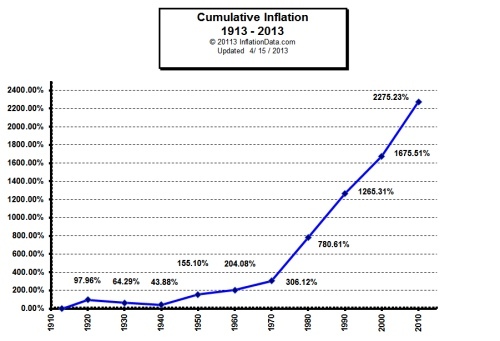 As you can see from the cumulative Inflation chart since 1913 we have seen 2275% inflation. Yes, that is right Two Thousand Two Hundred Seventy-Five percent inflation. It is difficult to wrap your mind around 2200% inflation. But that means that prices increased by 2200% or they cost 22 times more. When inflation is in the single or double digits this concept is easier to follow. For example from January 2005 to January 2006 there was 3.99% inflation. That means that something that cost $100 in January 2005 would cost $103.99 in January 2006. In other words you add the increase due to inflation to the original amount. 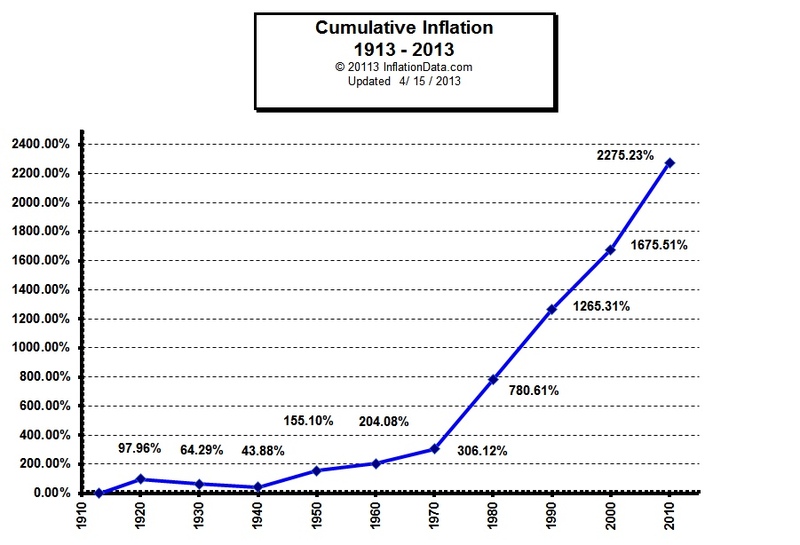 So if we have 2275% inflation, something that cost $100 in 1914 would cost $2375 now. (The original $100 + $2275 inflation). Something that cost $100 in 1914 would cost $2,375 now! Example prices: The Model T was first produced in 1913 and sold for $575. Ford continued to produce the same model until 1927. By 1927 however through mass production Ford was able to reduce the price of a Model T to $290. In 1927 Ford introduced the Model A which ranged from $385 for a roadster to $570 for the top-of-the-line Fordor. In 2012 the MSRP for a bare bones Ford Fiesta was $13,995. $575 starting price + 2261% inflation and you get $13,575 which is amazingly close to the actual price of the Ford Fiesta but today you would get the bottom of the line rather than the top of the line for that price! But to be fair although the 1927 Fordor was top of the line and had much more metal than todays cars it didn't have "antilock brakes, stereo sound systems, GPS tracking systems, On-Star, Air-bags (or even seatbelts), Automatic Transmissions, Air-Conditioning etc. It's possible that even windshield wipers were optional in 1927. You can plug these numbers yourself into our "How Much Would it cost Calculator" which is on the same page as our Cumulative Inflation Calculator. 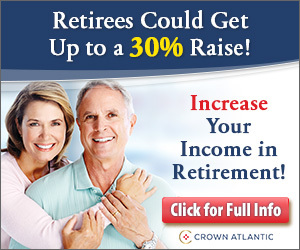 So whenever someone mentions 3% inflation as being low remember compound interest can work for you... but compound inflation can work against you too! and we will keep you up-to-date on what is happening in the area of inflation, interest rates and market trends. Webmasters if you would like to use any of our charts please check our usage policy. Too much Credit card debt? Read this article on How to save $1000 a year on interest and pay off your cards faster. Low Mortgage Rates- Reduce your Payment or the length of the Loan?